Stuff.tv just put up a nice little piece of equipment that would probably be a great starter for anyone looking to get into mid-fi with out buying 3 different types of equipment and worrying about matching and sound. The CR502 plays CD, super audio CD, mp3 cd, ipod (USB connector on the back) and have 2×25 Watt amplifier. Pair this with some nice bookshelf speakers and you’d have a sweet little set up. The CR502 also has FM and Digital Radio tuners. (Do people still listen to the radio? For music that is.) If they could get this plugged into the net and hooked up with Pandora Marantz would have hit the sweet spot with me. Fronting up for loads of separates is hardly wise in these financially frisky times. So instead, bagging yourself an allâ€“inâ€“one system is definitely the smart way forward. 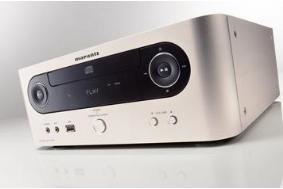 And this new Marantz CR502 is our pick of all the latest goodies to cross our desks. read the rest, and look forward to Stuff’s review….